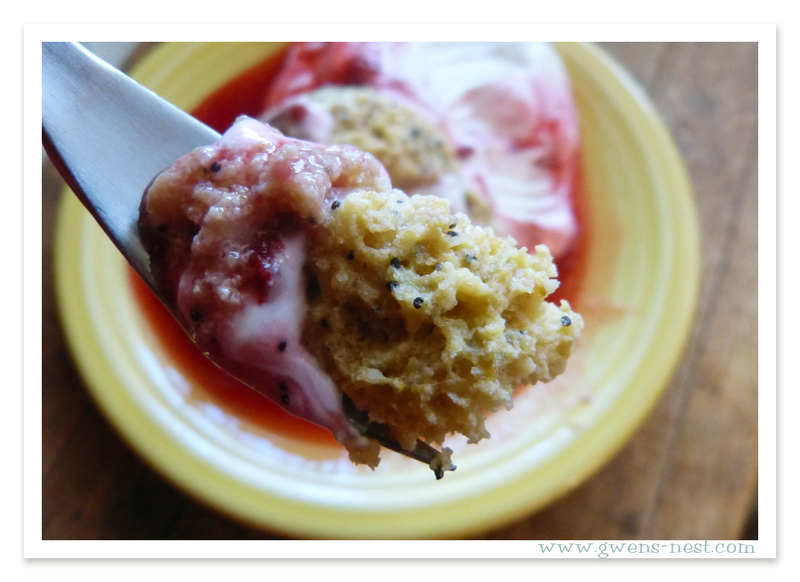 This (low carb) lemon poppyseed muffin is one of my favorite ways to start my day. Lemons and poppyseeds make me cheerful. This is a really quick recipe to toss together, and you can either bake it up in the oven (in regular muffin cups…it will make 3 muffins), or microwave it in a mug for less than a minute. The end result is warm, steamy, tart muffins that keep that blood sugar nice and stable, and fill your tummy until lunch! Start with flax, coconut flour (not pictured and optional), one egg, half a lemon, sweetener of choice, salt, butter, baking powder, poppy seeds, lemon essential oil (I love NOW brand)…WHEW! OK. Lots of ingredients there. So, to make our lives easier, in the printable, I’ll give you a recipe for a master mix, to make this a LOT easier to whip up in the morning. If you’re used to making some of the Muffin in a Mug recipes from the Trim Healthy Mama book, then the coconut flour is a new addition. My daughter and I played around a bit with this version, and took out 2 T of the flax or almond and subbed one T of coconut flour instead. We love the lighter feel and fluff of this version! But you can always choose to use all flax, or sub 2 T. of the almond meal for the coconut flour called for. It’s totally up to your tastes and what you have on hand. My sweetener of choice is NuNaturals Stevia Extract Trim Healthy Mama Stevia Extract. A microscopic, fine dusting is all you need to achieve a nice gentle sweetness with no icky aftertaste. My trick here is to twist the cap so that 3 of the small holes are open. Gives me more control when adding my sweetener sprinkles. Once you get all of your ingredients into the mug, whisk really well. We don’t want any eggy chunklets in there. Then bake according to your favorite method. I love to serve with a side of Greek yogurt, and my raspberry sugar free syrup recipe. SO, so yummy and decadent! This is a much finer breakfast than I used to eat, and is so much kinder to my blood sugar and waistline. 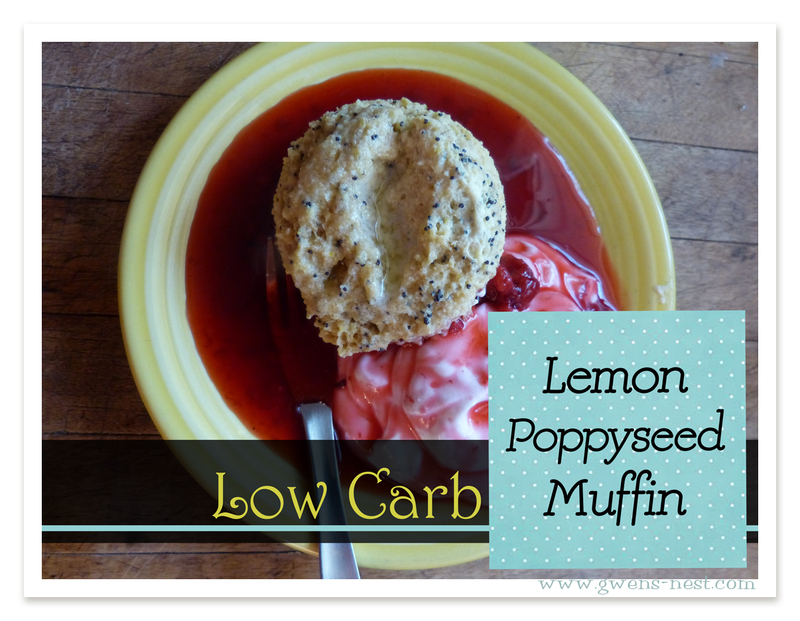 This lucious low carb lemon poppyseed muffin is an "S" breakfast if you're following Trim Healthy Mama. One of my favorite ways to start the day, you can either bake it in a mug in the micro, or in a regular muffin tin to get 3 muffins. Recipes below are for a single muffin, and for a master mix that makes 16 mug muffins. Blend all ingredients in a mug or a small bowl (if you plan on baking in the oven). Mix really well to make sure that your butter and egg are evenly incorporated. Bake in the microwave for 50 seconds or so, or in the oven at *350 in 3 regular sized muffin cups. If baking in muffin cups, greasing the lining paper is a good idea, or use silicone liners for easier removal. Blend all dry ingredients in a jar. To prepare a muffin in a mug, add ¼ cup of dry mix (1/3 cup if you used all flax or almond meal/flax), one egg, juice of ½ a lemon, 1 T of butter, and a couple drops of lemon essential oil. Mix well, to incorporate the butter & egg. Bake according to the instructions above. Underdone is way tastier than overdone. Feel free to quadruple the recipe amounts to make one dozen breakfast muffins. Think you might have accidentally left out butter in your ingredients list. 1 T? How long and what temp in the oven? We don’t micro ;). GAH! I see it now, sorry! 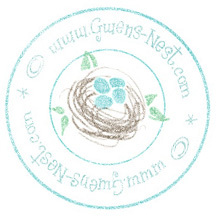 I know Gwen has had a lot going on lately & probably hasn’t had the opportunity to reply, but I thought you may have figured it out another way. Sounds good. Having just made a master mix I’d like to make a few smaller ones ahead of time for snacks. I made these replacing the 1 Tbsp. coconut flour with two Tbsp. almond flour. It made three muffins. I baked them for 12 minutes @ 350º. They turned out perfect! the THM muffin in a mug recipe in the book says 15 min, 😉 HTH! Would they be considered an S or an E according to THM? They look terrific! I’m not a lemon fan so I’m hoping to make some Almond Poppy Seed muffins. Do you think that will work if I just add almond flavoring in place of the lemon essential oil? Almond would be delicious! Just use 2 t. of water instead of the lemon and a t. of almond extract. Great idea! Pinning this so I can reference it later! Thanks for sharing! I plan to try this recipe this evening. Will dried coconut that I’ve ground in my blender work for the coconut flour, or does it need to be truly, bought-from-the-store coconut flour? I’ve not cared for any of the MIM recipes (I’ve tried multiple ones/times), but I want to give this one a go. I used storebought coconut flour, which I think is defatted (so home ground would be slightly different). The quality and fine-ness of the flax makes a BIG difference in the MIM recipes, IMO. Hope you find one that you enjoy! I really like the lightness of this recipe. I have everything except the essential oil, can I make it without? I make mine with 1/2 tsp lemon extract! But if you don’t have that, perhaps add a little lemon zest? This was phenomenal! Thank you SO MUCH for sharing! Yum! I just had two. Is that allowed? LOL Then, I decided to make them as muffins to freeze for when I need them. Thanks! I finally got to make this with the exact ingredients. So tasty! Gwen, I am now addicted to these! I am still just “dabbling” in THM (have been for months), meaning that I’m just trying recipes but haven’t started the full plan. We have had a crazy year and are moving in a few weeks. 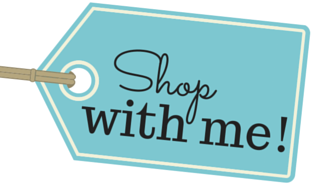 I cannot WAIT to get settled and start the full plan and use some of your recipes!! So glad you’re enjoying the recipe! One of my favorite things about THM is that it’s quick enough to implement most of the plan even in very busy seasons. However, I agree that a busy season is NOT the best time to tackle learning a whole new way of eating…but you’re getting a great head start finding recipes that you enjoy! Happy Moving! Is it really 2 tablespoons of baking powder? It seems that would make it taste soda-ish. The single muffin takes 1/2 t.
Yummy! 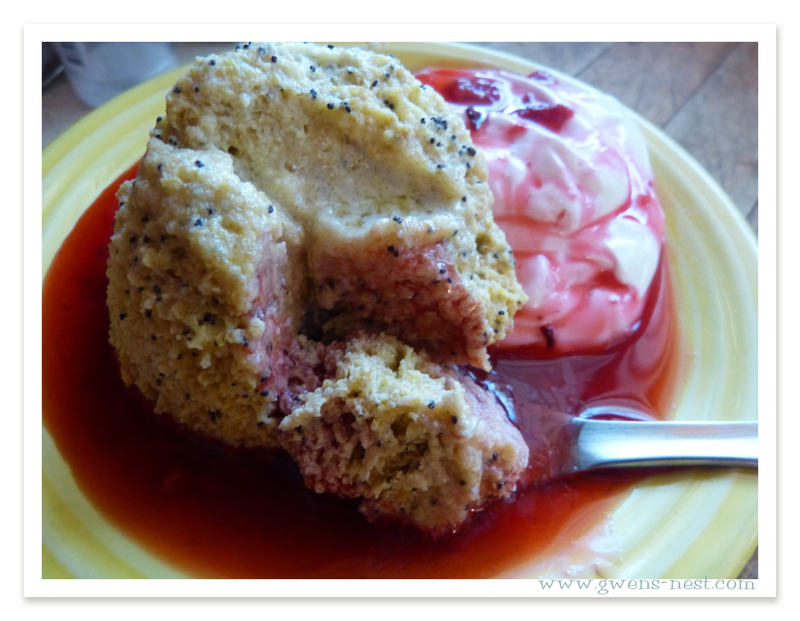 Just made the lemon poppyseed (minus the poppy-had none)….going to make them next time with a few blueberries thrown in!!! Thanks for all your recipes….Fellow Mama! You’re very welcome! Blueberries sound yummy too. 🙂 I often use chia seeds now in place of the poppy seeds…even more nutrient rich! I need to adjust this to remove the flax. Any suggestions? As much as I do love this with butter, I needed to switch to coconut oil (1T) to get more into my diet. which part of the recipe is quadrupled for breakfast muffins? How much THM stevia would you use in place of the Nunaturals? Is THM stevia a stevia/erythritol blend? 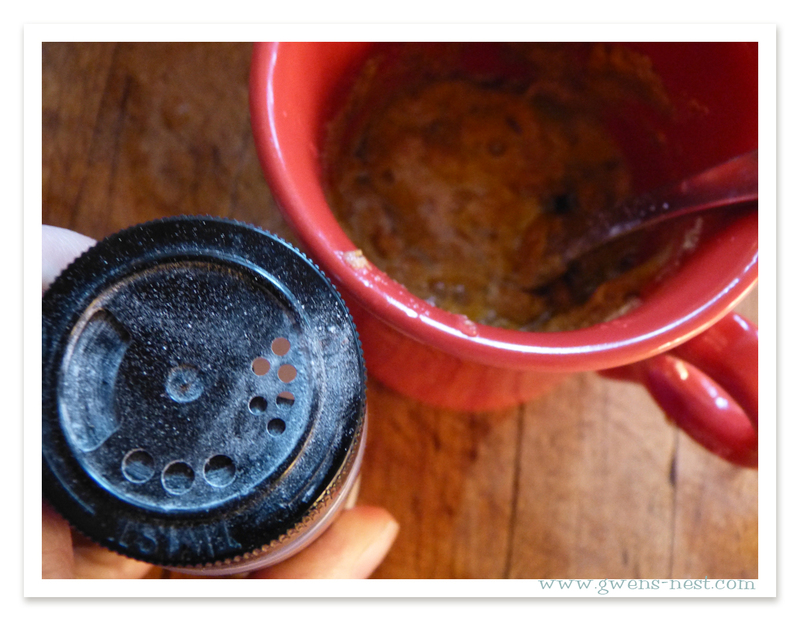 If so, I use 3 scant tsp in my mugs. Yep…theirs is erythritol and stevia, but a lot sweeter than Truvia. Ow many eggs do I use for the master list? My favorite MIM, made a few subs. Used the flax and coconut flours, replaced butter with coconut oil. replaced Poppy seed with chia seed. Think i may add a little shredded coconut to the top for texture. New to THM love being able to eat well and eat dessert. Thank you so much. If i use almond meal do i leave out flax? I’ve not made it with just almond meal…maybe try a blend? 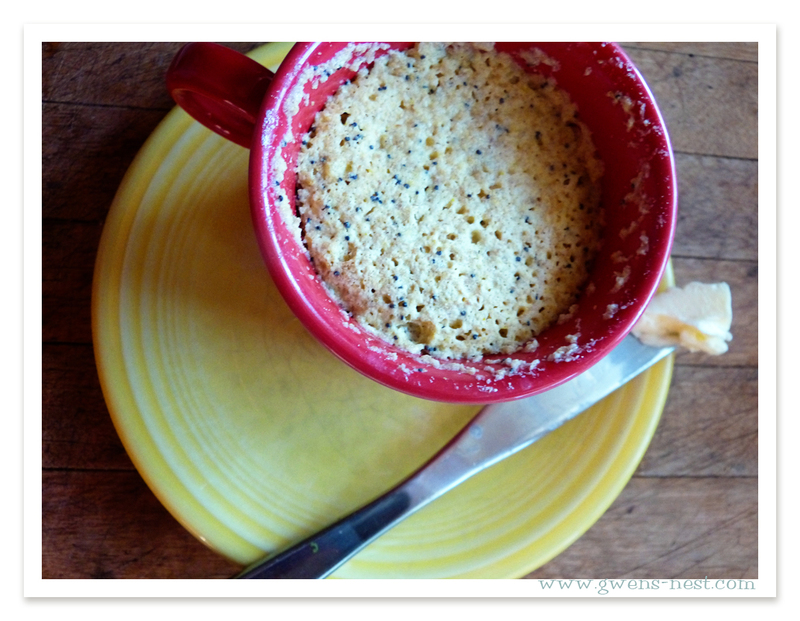 We eat this (sans poppy seeds, not easily located) almost EVERY MORNING! I ran out of eo so I am using 1/2tsp lemon extract, still awesome! We also don’t use the coconut flour, but use 1TBS almond flour with the 2TBS flax, still fluffy and yummy 🙂 Grateful for this recipe, it has revolutionized my eating and saved me from egg boredom! Ha! I get the egg boredom thing. 🙂 I’ve used chia seeds in place of the poppy seeds for the same effect! These sound yummy. Do you know how many net carbs they are per muffin? could you tell me how much sugar/spoon for spoon substitute to use? Hi Ski- maybe this stevia conversion chart would be helpful to you? My guess would be 1 1/2 to 2 packets of other types of sweeteners for this recipe. Thank you,I’ve made the muffin-can you tell me how many muffins are made with the master mix so i can adjust it for that? You can multiply up to as many as you want in your master mix. I think I made 6 or 8? I love lemon poppy seed muffins! Question, though. For the individual serving, you use juice from half a lemon, but when using the Master Mix, you add juice from one whole lemon. Which is correct? Thanks for a great recipe! Love the Master Mix idea! 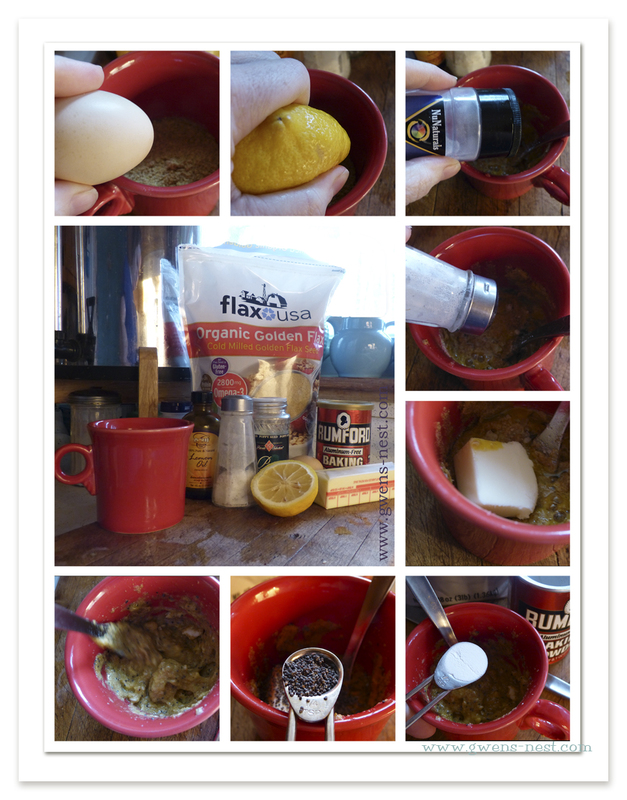 For the master mix, I don’t add the lemon juice and other wet ingredients until I’m actually making up my muffin. It’s just the dry ingredients that I jar up and store to make it faster. If you’re going to make a dozen muffins or something, then you’d use more mix and multiply the ingredients by however many muffins you’re making. Does that make sense? I was asking about the lemon juice, because for the single muffin directions, you use juice from half a lemon. Under the Master Mix, you list single muffin directions, again, but list juice from one whole lemon. That’s where I was confused. “To prepare a muffin in a mug, add ¼ cup of dry mix (1/3 cup if you used all flax or almond meal/flax), one egg, juice of one lemon, 1 T of butter, and a couple drops of lemon essential oil. Oops! Good catch. It’s supposed to be half of a lemon there too. I’ll fix that! Thanks! Made this last night! LOve it!! I used 3 1/2 tbls of carbquick only and alot of splenda. smothered it in whip cream. Yum! Thanks for this recipe!! Is this a tsp it tbs? Tablespoon is capital T. 🙂 I’ll type it out.